We were appointed to provide Architectural services on this project in Baildon, near Bradford, and after successfully obtaining planning permission via Bradford Council, we undertook the building regulations application and construction drawings. 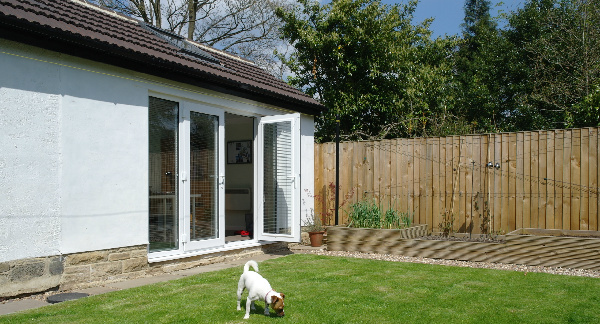 The form of the existing garage was continued into the rear garden to form an attractive, light and spacious home office for our clients to work from. A full height, vaulted ceiling with Velux rooflights, along with glazed doors and full height side panels allows a good deal of natural light to benefit the space, and create a pleasant working environment. High level bespoke shelving and recessed spotlights add to the contemporary feel of the extension.